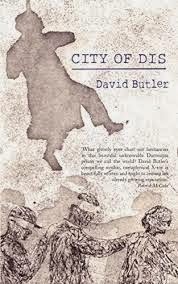 BleachHouseLibrary.ie: "City of Dis" by David Butler. GIveaway. This novel was featured in the review section of Irish Independent, yesterday, and now I feel like entering this giveaway myself! Just enter via the rafflecopter link at the end of the page. Open INT. Good Luck! Willy Regan, son and carer of his blind mother, Moll, is the questionable narrator of this tale of petty doing, coming of age and falls from grace. Freed from the drudgery of his humdrum life, following Moll's death, Willy embarks on a new life filled with hope. But three relationships drag him down, the first a criminal thug who used to bully him in school, the second a depressive man he saves from suicide and the third a polish poetess who uses her charms to convince him to partake in dodgy schemes. Willy is far from blameless, far from noble and his narration is not always trustworthy yet despite his actions and distractions he remains a character who values truth and attempts to do the right thing. Even if that leads down the path of disgrace. A novel that makes the city a character and draws the reader into the slightly slimy world of the desperate and the huckster, City of Dis is a page turner that combines elements of noir and Dickens to create memorable characters, scenes and images that will remain with you long after you read the last page.